If you remember, the dresser looked like this when we purchased it. The woman we bought it from was in the process of redoing it and even though I absolutely loved the stained top with the blue. However, the color was almost identical to our bedroom walls and since it’s a huge bedroom and a rental, I didn’t feel like painting. So after doing a bunch of research on Annie Sloan Chalk Paint on my favorite DIY blogs, I determined that I wanted to use Old White and keep the top of the dresser stained. Of course, The stockist closest to me was sold out of Old White, so I had to wait about a week for it to come in. When it did, I purchased 2 quarts to be sure I had enough for other pieces of furniture too. Pretty...but because the Old White has a very warm, yellowish tint to it (moreso than I thought after seeing tons of furniture redos with this color), I was disappointed. I'm sure part of it was the lighting in our place, so I recommend testing the color in the room before you commit. Old White made the dresser was look too cottage-y (is that a word? If not, I just made it up). It wasn’t that clean, fresh and light look I was going for with the master bedroom redo. You can see my inspiration here and on Pinterest here. So off I went to the stockist with the one can of Old White I hadn’t opened to exchange it for Pure White. It totally figures I didn’t end up using the Old White after all the buildup I had in my mind about how great it would be… ha! 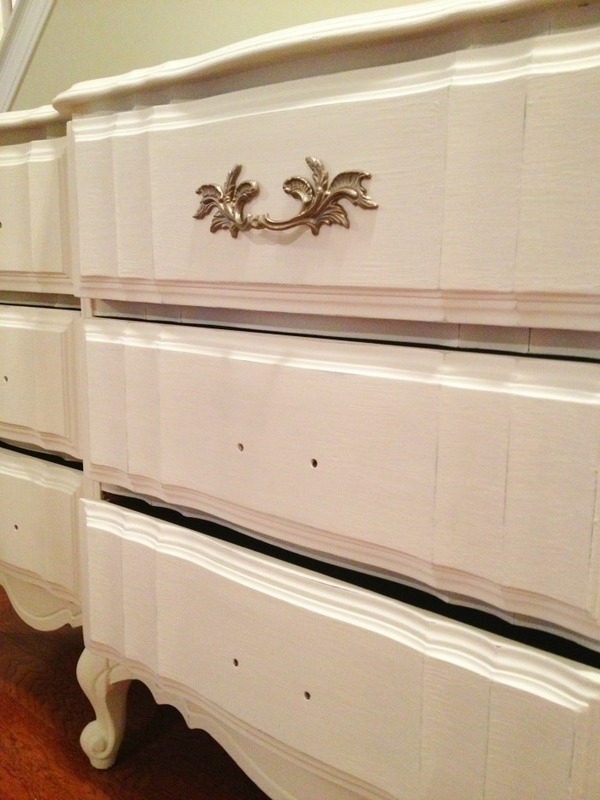 The picture below is the dresser with 1 coat of Old White, and then 2 coats of Pure White. I hadn’t waxed the dresser when I took this photo. You guys probably think I’m insane for painting over the beautiful stained top of this dresser and I kind of agree but I’m happy with the result. It isn't as exciting as the original blue and brown version, but this goes much better with the bedroom and I figured I can always change it again down the road. Then it came to figuring out what color to make the antique hardware. I first attempted to clean it with Brasso and after letting the cleaner sit on two handles for over 30 minutes, they barely came clean and it was a total pain trying to clean all the look nooks and crannies. Knowing I didn’t want them gold anyway, I gave up on that plan and picked up some Precious Metals Leafing Finish in “Titanium” at Hobby Lobby. Start small. Don't use a 5 foot dresser like I did for your first project. I had painted furniture before with latex paint but this is a different ball game. Even though I enjoyed doing it, I had to stop myself from rushing through the painting process because I just wanted to see the end result. If you don't want brush strokes, this is not the paint for you. While there are ways to minimize the brush strokes, this paint is meant to look hand painted. It was hard for me to get past that. Now I like it, but especially after the first coat you may kind of panic because of all the brush strokes. But don't worry, it will get better. Before painting, I read in several places that the paint will last a long time because coverage is so good. I was skeptical though because again. this is a 9-drawer, five foot dresser. I also read that coverage varies depending on color. 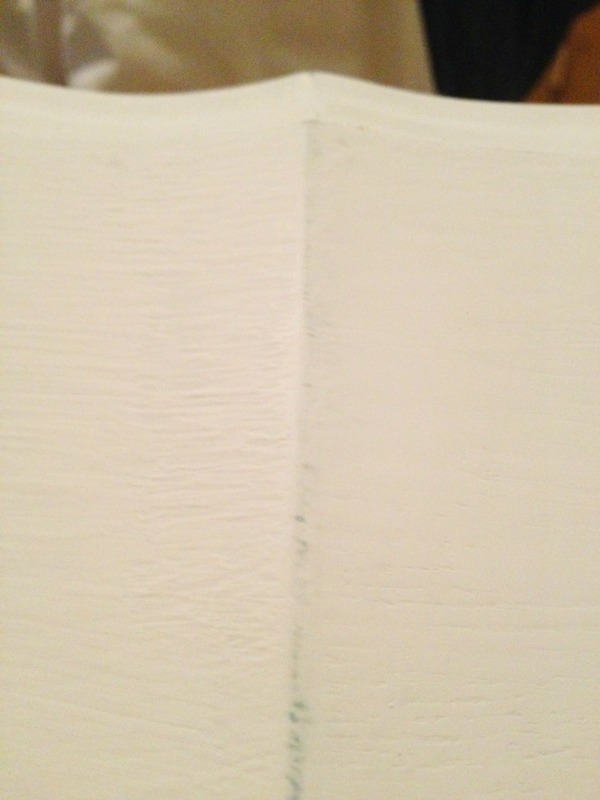 To me, Pure White was thicker than the Old White. About a cup of paint lasted me the entire dresser and drawer fronts (excluding the top of the dresser) for each coat. After two coasts of paint on the body, 3 on the top, and some touch ups here and there, I ended up using about half of the quart of Pure White for this dresser. My only complaint is that it was really tough to cover the top of the dresser, I kept seeing areas that were lighter or darker than others. I honestly cannot imagine painting a dresser like this with such intricate detail and curves with any paint other than Chalk Paint. I’ve painted furniture with latex paint in the past and it is so much work between sanding, priming, painting, sanding again and then painting again. Remember, Chalk Paint is not a magical paint that will result in zero brush strokes. I learned that you can reduce your brush strokes by A) diluting the paint very slightly with water particularly on your second coat and B) sanding with a very fine sanding sponge. So that is what I did, using a 320 grit sanding sponge. It's hard to tell but you can see in this picture the difference between the sanded (right) and non-sanded (left) portions. 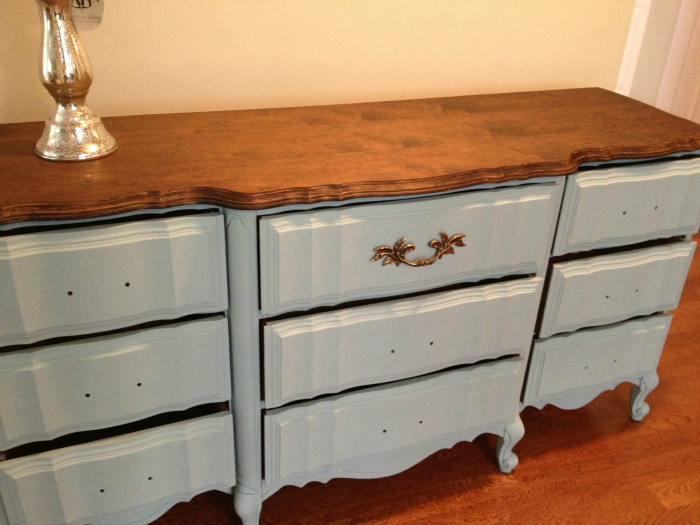 With all of that said, I think I would definitely use the Chalk Paint again. 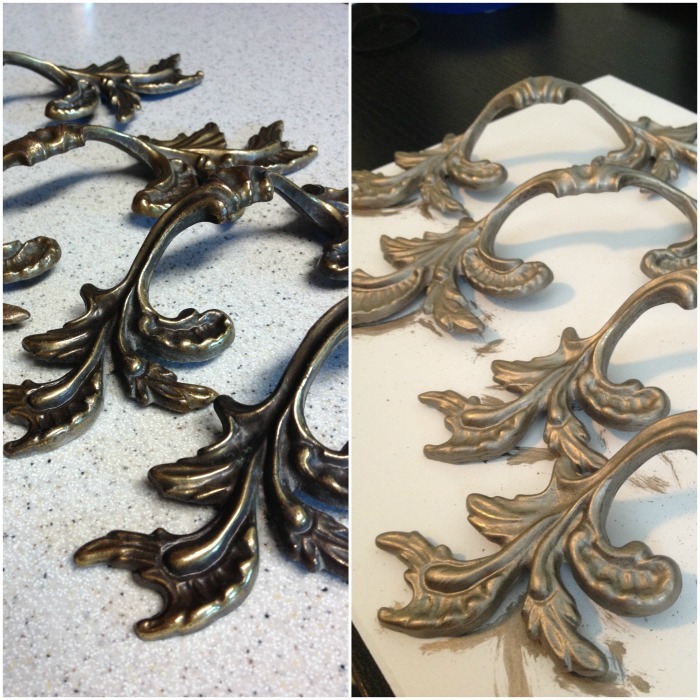 Even though the paint is a bit more expensive, the process is so much easier. Just make sure the hand-painted look is what you are going for. What do you think so far? Feel free to ask if you have any questions! Stay tuned for the second part on waxing and the final reveal next week! Update: You can see part 2 of my chalk paint dress redo here! Looks great do far, I love the all white! looks awesome! So crisp and refreshed. I can't wait to see the final reveal. Thanks Brett! That's exactly what I was going for! I was planning to share everything in one post but this one had a mind of its own.. haha! Great post! Been looking for tips on doing a paint job like this. Thanks for sharing!